Tilo is a modern scarf collection that combines classic style with distinctive prints. Inspired by the wanderlust of the founder, who enjoyed scarves as a wardrobe essential during her travels, these are generously sized and made from a divine combination of cotton and modal. When tied, they have a lovely color palette that adds texture and spark to any outfit. When opened, many offer a surprise image. They're ideal for year-round wear by either wrapping around your shoulders in the spring or wrapping tightly around your neck in the winter.They add a luxurious layer perfect to wear now and keep forever. Chill out by the water in Tilo's Beach Scene Scarf. This vibrant piece adds a fun pop of color to any outfit, and is perfect for those windy beach days. Plus, the lightweight cotton and modal blend is sure to keep you feeling as cool as you look. 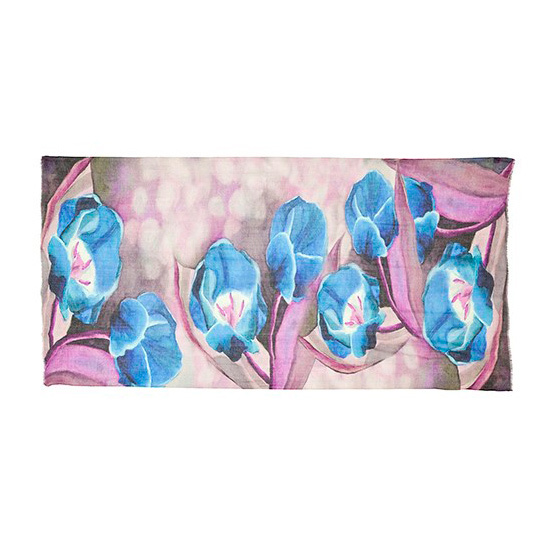 Accessorize any outfit with the Blue Flower Scarf by Tilo. The soft, pale colors and beautiful floral print add the perfect touch of stylish mystery to any outfit. Pair with a solid white top and skinny jeans for the perfect look. Fly away with Tilo's Butterfly Print Scarf. The abstract and colorful print is sure to turn just as many heads on your walk through the park, as on your daily coffee run. Pair with skinny jeans and a cardigan for a stylishly cozy look. 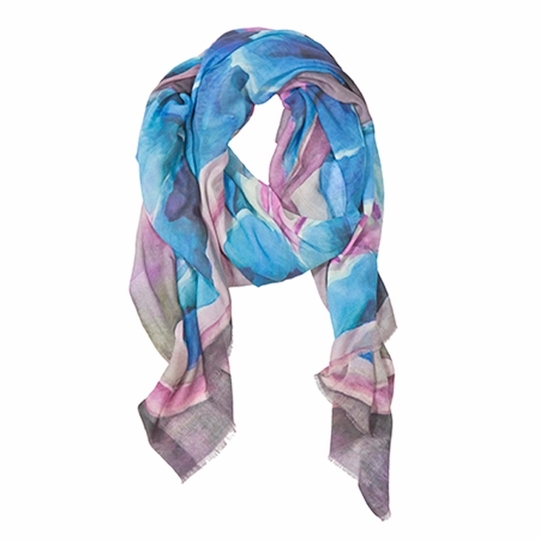 The Marbled Print Scarf by Tilo is a true work of modern art. Its thick texture and bright colors make for an eye catching piece that blurs the lines between fashion and art. Pair this scarf with skinny jeans and booties and let your creativity shine. Whether you're headed to an indie film fest, or brunch with the girls, the Pigeon Print Scarf by Tilo is the perfect blend of unique and chic. This artistic scarf ties together fashion and creativity beautifully. Wear Tilo's Resort Town Print Scarf to the pool, or on your next vacation. This vibrant and sunny scarf is great for a day of poolside relaxation, and pairs perfectly with a maxi skirt and solid tank. The lightweight cotton and modal blend is sure to keep you feeling light and breezy all day long. Bring any outfit to life with the Tilo Watercolor Scarf, a luxurious accessory to keep forever! The bold and graphic modern print is awash with a beautifully bright watercolor pattern. Tilo is a modern scarf collection that combines classic style with distinctive prints. Inspired by the wanderlust of the founder, who enjoyed scarves as a wardrobe essential during her travels, these are generously sized and made from a divine combination of cotton and modal. When tied, they have a lovely color palette that adds texture and spark to any outfit. When opened, many offer a surprise image. They add a luxurious layer perfect to wear now and keep forever.